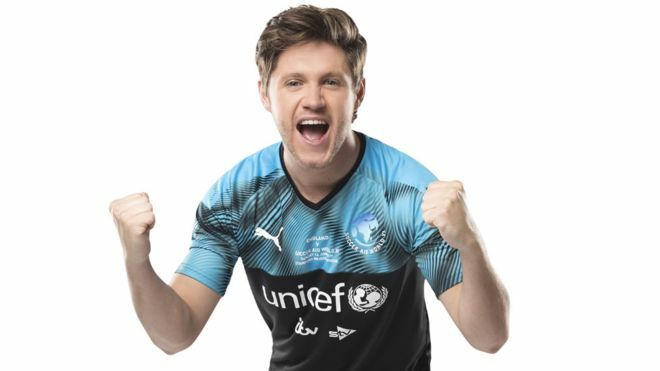 Niall Horan will once again line up in the Soccer Aid for Unicef annual charity match. The Irish singer faced off against his One Direction bandmate Louis Tomlinson at the 2016 tournament, with his team losing 3-2 to England. This year he is playing for the Soccer Aid World XI team against England. His teammates will include the world’s fastest man Usain Bolt and former Chelsea striker Didier Drogba at the 16 June match at Stamford Bridge stadium. Soccer Aid, which was co-founded by Robbie Williams and Jonathan Wilkes in 2006, sees celebrities and ex-professional footballers join forces in aid of Unicef. Love Island star Kem Cetinay and freestyle footballer Billy Wingrove will also run out alongside Horan for the World XI side, managed by I’m a Celebrity… Winner Harry Redknapp and Piers Morgan. Morgan’s Good Morning Britain co-star, Susanna Reid, will manage the England side next to ex-actual England football manager Sam Allardyce. In 2016 Allardyce left his post as real England manager by mutual agreement with the Football Association after one match and 67 days in charge, following a newspaper investigation claiming he offered advice on how to “get around” rules on player transfers. Their squad will include Olympic champion runner Sir Mo Farah and Redknapp’s ex-footballer son Jamie, as well as TV presenters Ben Shephard, Mark Wright and fitness expert Joe Wicks. Jeremy Lynch will go head-to-head with his freestyle partner Wingrove. Robbie Williams is unable to take part in the match this year due to his Las Vegas residency, but he remains a Unicef UK ambassador. © 2016 Hot Hits UK. All Rights Reserved.